Live sky testing is often required in addition to simulation tests. Live sky testing is essential for understanding the complexity of the environments in which your GNSS-enabled devices are used. Consequently, GUIDE has several live testing platforms to meet a wide range of transportation requirements. A minivan is equipped to navigate city streets with perfectly plotted trajectories to serve as a benchmark. In spite of the reduced availability of satellite links and multi-paths due to urban canyons, on-board equipment accurately records the vehicle’s different positions. High accuracy, integrity, and availability of measurements thanks to equipment that minimizes the errors associated with urban environments. Time gains thanks to the immediate availability of a calibrated, equipped vehicle. Control center to monitor tests in real-time and in particular to ensure that the desired data is properly collected. Measurement security with a regulatory-standard operator seat in the back of the car. 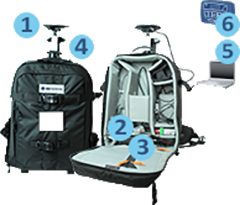 A backpack equipped with an antenna and containing a mini GBOX completes the equipment dedicated for Urban Zones. This measurement tool makes it possible to navigate in pedestrian areas and to record positions where vehicle access is impossible. This solution is specifically designed for the smartphone market where the number of applications is fast expanding but which is characterized by highly inconsistent geo-location service quality depending on the hardware and software configurations involved. A fleet of eight GBOX equipped HELICOPTERS (8x EC120) perform altitude tests and assess the reliability of receivers during landing and takeoff. FOR UAVs (Unmanned Aerial Vehicle), an ultra-light, mini GBOX has been specially designed to facilitate the development of dedicated GNSS receivers for this market. A GBOX-equipped boat combined with other equipment is available to perform maritime and river testing. Communication devices specifically designed for the maritime environment have been installed on-board to improve real-time GNSS positioning. 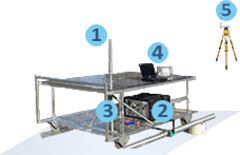 The high-accuracy test platform consists of tracks fitted to the nearest millimeter and a specially designed trolley that moves on the tracks with a high degree of accuracy. A GBOX hybridized with a linear coder guarantee measurements with uncertainties less than 1cm.